When Minerva Rus’ dead childhood friend returns to life, she discovers she has the power to raise the dead — plunging her into amazing possibilities and terrifying danger. 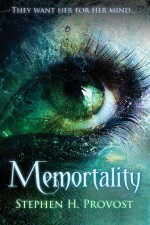 Memortality is a genre-breaking new contemporary fantasy novel that poses one of the most frightening questions of all — what if the dead don’t stay dead? We all fantasize about reuniting with lost loved ones, but would any of us want to be responsible for wielding such power? And if good people can be revived, what about evil ones? Pursued by a rogue government agent who wants to eliminate her and her talents, Minerva must learn to control her powers to save herself and Raven. Because if she dies, Raven will die as well — again. 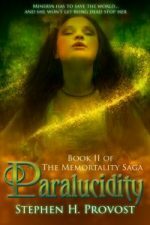 Racing to learn the secret of how and why her powers operate, finding unlikely allies, facing a truly frightening villain and battling her own demons from her abusive childhood, Minerva finds that she is fighting not just living evil, but the terrifying prospect of bringing back an evil that had been long defeated. Featuring an intrepid, take-charge female protagonist who lets nothing — not disability, not death, not loss and heartbreak — stand in her way, Memortality blends fantasy, mystery, espionage and romance in a compelling story that will keep readers gripped until the final, startling revelation. About the Author: Stephen H. Provost is a journalist and author. He has worked as an editor, reporter, and columnist at newspapers throughout California. He is the author of Fresno Growing Up: A City Comes of Age 1945–1985, a history of his hometown. Provost lives with his wife on California’s Central Coast, where he is the editor of The Cambrian newspaper. Provost frequently blogs on writing and current events at his website, stephenhprovost.com.